It’s no secret that e-commerce growth and low unemployment are creating a major labor shortage in the warehousing and logistics industry. Rapid growth of e-commerce will create a demand for 452,000 new warehouse and distribution workers in 2018-19. That’s an enormous increase over the industry’s job growth since 2013, which averages 180,300 new positions per year. But labor supply isn’t keeping up with this demand, while 18% of current warehouse workers are nearing retirement age and supply chain jobs require skills that only 20% of the labor force possesses. 1. Improve warehouse productivity, efficiency, and accuracy. Many of the world’s leading warehousing operations are adopting multi-modal voice-directed fulfillment technologies. These mobile computing, scanning, and printing solutions integrate with warehouse management systems to help automate and accelerate fulfillment processes, creating cascading benefits in the distribution center. For example, by using our Voxware voice management suite (VMS) and Zebra mobile computers, scanners, and printers, companies are able to achieve 99.97% picking accuracy and 30% or higher productivity gains. At a time of labor shortage, achieving this added productivity and performance with your current workforce is invaluable. 2. Make warehouse work more attractive. Warehouse work is tough. Workers often walk 10 to 15 miles a day, for 10 to 12 hours, in hot or cold environments. They do a lot of lifting, pushing, and repetitive tasks. Voice-enabled systems ease this burden by automating more of the process, directing them to the right warehouse locations along the most efficient paths, and allowing them to scan and validate correct picks and even print shipping labels on the spot. This minimizes the distance they need to travel, makes it easier to pick and ship products, and gives them access to all the information and functionality they need—anywhere in the warehouse. Voice technologies can be a major differentiator over the competition in recruiting and retention. 3. Balance rising labor costs. To attract and retain warehouse workers, companies are having to pay more per hour, but they can counter-balance some of those cost increases by using voice-directed technologies and automation. 4. Simplify and expedite new worker training. Voice-directed systems use the latest mobile computers with touch screen interfaces that are as easy for workers to use as the smartphones or tablets they use at home. Coupled with easy-to-use, wearable barcode scanners and mobile printers, workflows are as simple as a tap of the screen or push of a button, and audible and visual cues guide them along the way. Faster and easier training means you can onboard workers more quickly and be more nimble in responding to seasonal or changing labor demand. 5. Take an affordable step toward automation. There’s a lot of talk about robotics revolutionizing warehousing and logistics, but it requires major capital investment and transformation that may not be feasible in the near term. 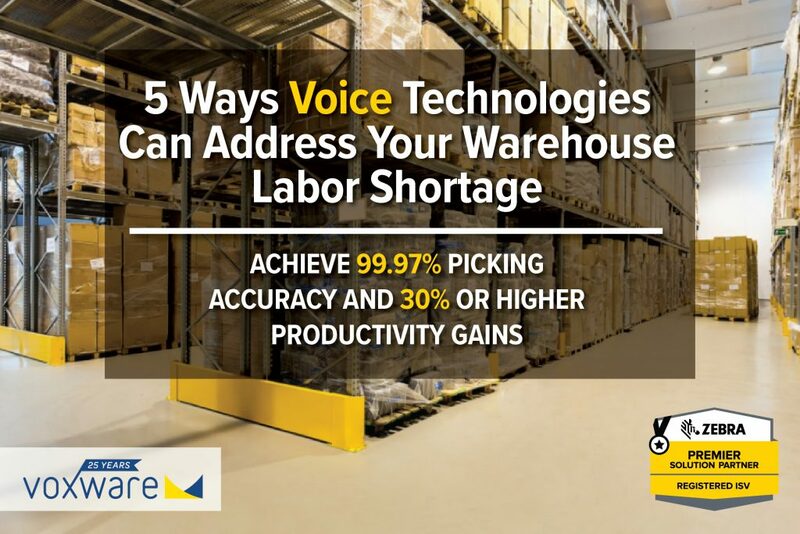 In contrast, voice-enabled, end-to-end warehouse technologies are considerably less expensive, are much easier to integrate and deploy, and don’t pose the visible threat to the labor force that robotic systems represent. Want to learn more about Voxware voice technologies? Download our white paper, visit www.voxware.com, or contact us now for a free consultation.